Have you ever wanted to take a DNA test to learn about your ancestry? I recently took a DNA test through GPS Origins (Geographic Population Structure) which is a new ancestry DNA test that will take you deep into your ancestral history and wow! Typically, DNA ancestry tests will offer to provide a report of your ‘ethnicity’ and identify continents in which your DNA can be located, but that is about it. DNA test do not traditionally get very specific. Oftentimes, you won’t even know the country from which your ancestors were from. 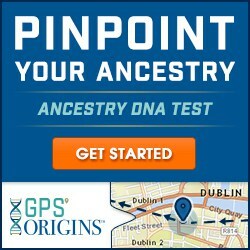 The great thing about the GPS ancestry test is that it combines the newest and best research in genetics with new tracking techniques that enable you to pinpoint more precisely where your DNA started. The GPS Origins test indicates the town or village where groups of your ancestors from different cultures met – building a vibrant picture of the migration journeys that formed your deep genealogical heritage. How great is that? It is amazing to me that we can delve so deep into these things now! It is truly amazing where technology has taken us, is it not? So what were my results? I have to say, based on what little I DO know about my family lineage, these results were totally correct for my father’s side. However, on my mother’s side, I know for a fact that I have Native American blood 2 generations back in a direct line, yet there was no mention of it in the test results. That being said, I was very interested to learn of my Nordic heritage! My ancestors were Vikings and explorers. If you have been thinking about taking an ancestry type DNA test, GPS Origins is a great resource. Plus, they are currently offering promo codes via their website so that you can save up to $10 on an Ancestry DNA test. They even offer an Ancestry Report for those that have already had their DNA Testing done elsewhere, so you can learn even more! This would make a GREAT gift. In fact, my husband wants one of these for himself. Once you submit the DNA testing, you should receive your results in just a matter of weeks. In case you were expecting otherwise, you may find that you are surprised by the results as they seem to be extremely accurate. With these results, you can find yourself with a sense of connection to the past as you will no longer have to wonder about your heritage. You can see where they started and how your ancestry line got to where it is now. It is really fascinating to read, and it sparked a sense of completeness to know my family journey. It is very cool and educational and I would highly recommend this. Once you receive your results, you can actually download them as a .pdf from the GPS Origins website (www.gpsorigins.com), so that you may keep them safely stored for future use. I wish it wasn’t so expensive. But even at 180$ that’s just impossible… Maybe next tax return or something. I think I shall. Thank you. I did this last year and loved it! Now hubby wants to do it too! My hubby wants one. Maybe for his bday.